Voice of the Collector: Michael Jeffrey Jordan- Love Him or Hate Him . 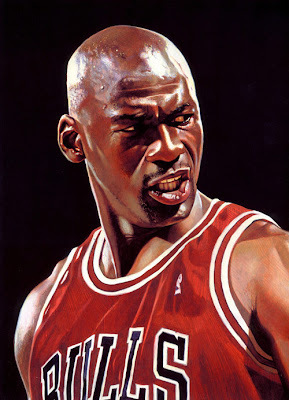 . .
Michael Jeffrey Jordan- Love Him or Hate Him . . .
. . . . it is undeniable that he was the greatest the game has ever seen. The more titles he and the Bulls won, the more people both loved and hated him. Being from Chicago I come at the subject of Michael Jordan with obvious bias of which I do not hide. The bottom line is, I was there to see him play AND all these years later, I miss seeing him play. The painting on the right IS Michael Jordan. What I mean is that look, that scowling glare. The look of an athlete on a mission. Not just a killer instinct but a "if looks could kill" demeanor that was not only intimidating but backed with superior play. I have seen that look on his face hundreds of times and rarely was the end result anything short of victory. This coming weekend, (which happens to coincide with my birthday) is Enshrinement Weekend at the Naismith Memorial Basketball Hall of Fame. This year's inductee's include not only Jordan but some other great players including John Stockton and David Robinson. It's so odd, because being enshrined at the same time, place, and stage, makes them seems like equals when every honest sports fan knows that is the farthest thing from the truth. On the collecting side of things, Jordan's tough. Why? Simply because he's expensive. He has only one legitimate RC in the '86-'87 Fleer (I'm sorry I just don't count the Star card as an RC) and they are hard to come by raw and in good condition without paying a substantial sum, let alone if you are looking for a graded version. Patches, autographs? Also insane in price. 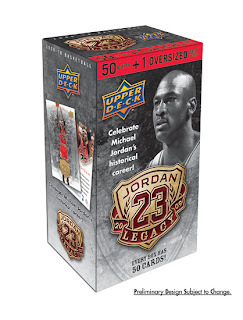 Upper Deck has an exclusive with Jordan and while there is plenty of supply, demand is consistent keeping prices at a premium. Despite this, there are several affordable items available to collectors interested in adding to or starting a nice Jordan collection. 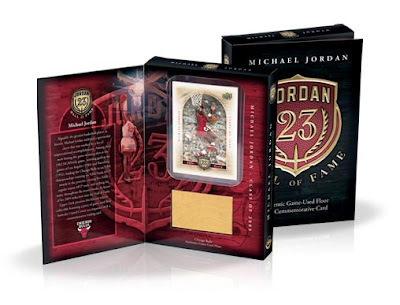 Recently, Upper Deck has released a special HOF catalogue dedicated to His Airness that includes some nice, yet affordable pieces of memorabilia. A here is a quick look at a couple of them.